Professional medical display manufacturer, DIVA Lab. (4153), today announced its latest product 58” 4Kx2K Quad FHD Monitor has won the COMPUTEX TAIPEI 2014 Best Choice Award (Touch & Display). The 58" 4Kx2K Quad FHD Monitor has wide application and can support a variety of video inputs. It is particularly suitable for using in special, professional occasions, such as operating room, medical center, teaching observation or broadcasting systems. This is the first time for DIVA to participate in the international exhibition show, and also the first time for its products to compete with rivals in Best Choice Award. Standing out from the competitors and winning the award recognizes DIVA’s efforts in research and development, and also demonstrates DIVA’s aspiration: Building Locally, Growing Globally. Best Choice Award is one of the honors at the world’s 2nd largest (largest in Asia Pacific) ICT procurement platform - COMPUTEX TAIPEI, where exhibitors of any given year may apply for the award. The award focuses on functionality, innovation and market potential as the main judging guidelines. The judges were amazed at DIVA’s idea of using trending, impeccable design in professional display. They also recognized its highly accurate overall performance of multiple high-definition screens shown on one display. DIVA is the only listed company in biotechnology sector of GTSM (GreTai Securities Market). DIVA mainly engages in research and development, manufacture and sale in medical, industrial and professional color display applications, of which more than 60 percent are for medical use. The main customers are leading companies in medical field which demands high quality products. 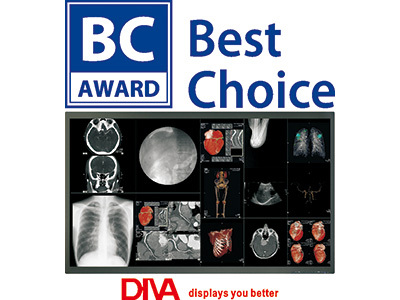 DIVA is the only ICU vital sign monitor supplier to GE Healthcare, the leading medical device manufacturer with 20 percent world-leading market share, and one of the only two suppliers of MRI IN ROOM monitors in the world. DIVA also expands into railway and shipping industrial applications. Now, DIVA has successfully tapped into Japanese railway professional display market, while is also the main supplier to Hatteland Display AS, the biggest navigation display manufacturer in the world. The award-winning 58" 4Kx2K Quad FHD Monitor will be on display in the COMPUTEX TAIPEI 2014 Best Choice Award area, as well as with DIVA’s entire display solutions in Nangang Exhibition Hall 1F (booth# K0705a). The solutions include 3M, 5M color and MONO displays for the medical diagnosis, accurate prepress and professional industrial panel PC. Aside from consistent high performance and reliability, the products on display boast trending, unique true-flat design and anti-infective feature for OR use, also highlighting their potential of meeting the demand for medical field.